ZX7 series welders are general MMA arc welder which adopts the latest pulse width modulation (PWM) technology and the insulated gate bipolar transistor (IGBT) power module. It can change work frequency to medium frequency so as to replace the traditional hulking work frequency transformer with the cabinet medium frequency transformer. Thus, it is characterized with portable, small size, low consumption and etc. ZX7 series have excellent performances: constant current output makes welding arc more stable; fast dynamic response speed reduces the impact from the arc length fluctuation to the current; accurate stepless current adjustment and pre-setting function. There are also some automatic protection functions for under voltage, over current, over heat, etc. inside the welders, when the problems listed before occurred, the alarm on the front panel is light and at the same time the ourput current will be cut off. 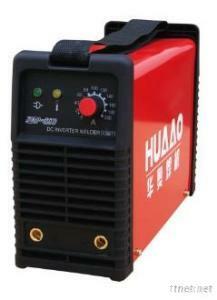 It can self-protect and prolong the using life and greatly improved the reliability and practicability of the welders. ZX7 series welders can also realize TIG operation. While MMA operation, if the electrode touches workpiece over two seconds, the welding current will drop to the minimum current automatically to protect the electrode. While TIG operation, the minimum current will be outputted firstly until the arc is ignited by lifting method, the output current will rise to the preset value, which can protect the electrode. At the same time, the arc force and hot start will be provided with MMA operation.